Our Executive Council is made up of elected volunteers who keep the wheels of our guild speeding down the quilting highway. Elections are held each November, and the new EC takes office each January 1st. 3. How did you find out about SFMQG? I was an individual member of MQG for a few years. But I wanted an in-person meeting, to meet new people and make friends. So when SFMQG became a chapter of MQG, I transferred in. 5. What is one thing we’d be surprised to learn about you? I was the USA Jr. Backgammon Champ. Connect with AJ on Instagram and online. 1. How long have you been quilting? I started quilting during a long, cold winter break in college. I had a sewing machine and plenty of free time. I picked up an Eleanor Burns "Quilt in a Day" book, dropped by a local fabric store, and I was hooked. 2. What kind of quilts do you most enjoy making? Whimsical, brightly-colored quilts featuring fun fabrics or patterns. I've also developed a knack for paper piecing and have started drafting my own patterns. 3. How did you find out about SFMQG? I founded it! I was a member of the New York City version of the Modern Quilt Guild for years. When I moved down to Florida in 2011, I hoped to find some local quilters who were interested in the modern quilting movement. I'm so proud and amazed that this group of talented ladies has grown into a fully-fledged and vibrant guild. 5. What is one thing we’d be surprised to learn about you? Can recite all 50 states in alphabetical order. 2. What kind of quilts do you most enjoy making? I like to make any quilt, any size...maybe not too much the minis. 3. How did you find out about SFMQG? I am the only one among my friends that quilts. I had found a quilt retreat in Iowa (where I still go every year), but I needed to find other people that share my same passion for quilting. So I went on line and found the SFMQG. 4. Where are you originally from? I am originally from Milan, Italy. I moved to Miami 21 years ago. 5. What is one thing we’d be surprised to learn about you? I am a SCUBA diving Dive Master. I actually met my husband on scuba diving trip. 2. What kind of quilts do you most enjoy making? Ones that feature books or libraries, or quilts that serve as a memoir of a person's life. 5. What is one thing we’d be surprised to learn about you? We helped over 30 foster kids when we lived in New Hampshire while our kids were still at home. 2. What kind of quilts do you most enjoy making? So far, paper piecing. 5. What is one thing we’d be surprised to learn about you? I used to train Standardbred Race Horses. 2. What kind of quilts do you most enjoy making? Improv, baby. 5. What is one thing we’d be surprised to learn about you? I founded the Guild for Art and Literature (GAL) of Coconut Creek in 2019. Connect with Kristin on Instagram or online. I learned to sew my Barbie new clothes by hand when I was 8. That led to years of making my own clothes on a Singer Touch & Sew sewing machine. In 1985 I married my college sweetheart & thus home décor became my passion. I started a small window treatment business, “Window Décor by Susan”. From there in 1987 I discovered quilting, making many Quilt in A Day log cabin baby quilts while awaiting the birth of our first child. I was hooked on quilting & in 2002 I opened a small quilt shop, The Village Quilter in Mt. Holly NJ. I enjoyed a fabulous 13 years growing the business & learning so much about the art of quilting. In March of 2016 I sold the business & now reside in Miami Beach with my husband & 2 dogs Mia & Bella. I am so honored to be part of SFMQG – such a vibrant & talented group of women! Andrea starting quilting ten years ago when she went away to college and visited a family friend who's house was covered in quilts. She is drawn to modern geometric prints and prefers improv style piecing and free motion quilting. Andrea enjoys learning new techniques and gleaning tips from more experienced quilters. Within SFMQG, Andrea participates on the Historian Council and is a Mentor for new members in the guild. She's been married to her high school sweetheart for six years, has three adorable sons. I was born and raised in Italy where I started "playing" with needles and threads at a very young age. Since quilting is not a tradition in Italy, it was embroidering and knitting under the supervision of my very talented grandmother. I moved to Miami Beach 20 years ago and started quilting 10 years ago. I consider myself a "OK" quilter as there is still so much I have to learn. Joining SFMQG helped me a lot in my learning process both with classes and talking to other more experienced quilters. Kate started quilting just 4 years ago. She comes from a family of quilters and sewists, and was inspired at a young age by her grandmother's quilts (and teeny, tiny stitches!). Kate is drawn to more modern designs, and loves improvisational designs and quilting. Her favorite part of quilting is design and working with her hands - she loves handwork, including hand-quilting and needle-turn applique. She found SFMQG just a couple of months after she started quilting, and has enjoyed being involved with this group, and getting to know so many like-minded quilters. When she isn't quilting, Kate is either teaching, coaching, or working on DIY projects around the house. Dee’s first experience with sewing occurred in her high school home economics class. The sewing project was an apron with ruffles and once completed, the apron was placed in a drawer, never to be worn. Dee joined the SFMQG after learning about the guild from 2 members whom she met at the 1st Mancuso Quilt Show held in Orlando. Dee credits the guild with her growth as a quilter. She looks forward to serving as the SFMQG Secretary. My mother taught me how to sew when I was 6. My first passion was garment construction and when my daughter was born I loved making her clothes. Sewing was always something my mother and I had in common and when she became a grandmother she started quilting and I followed suit. I became a stay at home mom when my daughter was 3 and that’s when I made the first of many quilts. My quilts always looked different than my mothers. They were brighter, had more white in them and I didn’t I like boarders on my quilts. It wasn’t until 2013 when my mother and I went to quilt week in Paducah that I realized the type of quilting I was drawn to was Modern. I found the Modern Quilt Guild and was hooked. I joined MQG and attended my first QuiltCon in 2015 and I just cant get enough. I am so happy I found SFMQG it is worth the hour drive to be a part of this wonderful group of talented modern quilters. I’m looking forward to the year ahead. Marianna started sewing in the seventh grade. She started quilting 25 years ago when she joined a small group in the Michigan farming community of Pigeon. 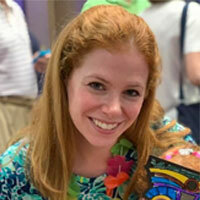 She took a 10-year hiatus when she worked as a costumer for several community theaters. She moved to Florida in August of 2015 and joined the Southern Florida Modern Quilt Guild that fall. She looks forward to getting to know more of the members of our guild. Linda is serving as VP of Projects in 2017 and has been with the South Florida Modern Quilt Guild since the Stitchcraft days. Linda started hand sewing with her mother's scraps as a little girl and moved on to making all her clothes in high school. Later raising twin boys whose wardrobes were limited to jeans and tee shirts there wasn't much inspiration to sew for the kids. An interest in quilting started in 1974 with a pattern for a quilted pillow in a women's magazine. That interest flared into a passion that has lasted a lifetime. A career in computer drafting in civil engineering and land surveying played right into the basics of quilting design. Linda has done years of traditional quilting but in the last few years has been drawn to the modern quilt movement. She loves the freedom that modern quilting encourages. Lately that passion has carried over into modern straight line quilting. Like others Linda is so happy to have found "her people" that all speak the same language. Claire’s love and ability to quilt was instilled at young age, by her mother. She enjoys making all different style quilts and relishes the entire quilt making process, from piecing to quilting to binding (yes, even binding). Claire also enjoys knitting, embroidery, reading, running, and lifting weights. Claire relocated from Indianapolis to the Palm Beach Gardens area with her husband in 2013 and is happy to have found a wonderful group of quilters in the SFMQG! Andrea starting quilting ten years ago when she went away to college and visited a family friend who's house was covered in quilts. She is drawn to modern geometric prints and prefers improv style piecing and free motion quilting. Andrea enjoys learning new techniques and gleaning tips from more experienced quilters. Within SFMQG, Andrea participates on the Historian Council and is a Mentor for new members in the guild. She's been married to her highschool sweetheart for six years, has one adorable son and two more on the way! Allison served as VP of Administration for our first board when we formalized in 2015. In 2016 she was elected President. Allison has only been quilting for about 4 years and is the first to admit she’s not the best quilter in our group! She’s learning fast and her favorite styles of quilting are “improv with intent” and modern machine piecing. Allison brings many years of professional leadership experience to her role, as well as a deep knowledge of brand marketing, public relations, and communications. After 28 years living abroad in London, she has recently settled in Florida and is delighted to have found “her people” within the SFMQG. Find Allison on her blog Savage Pink, and on Instagram, Pinterest, Flickr, Twitter and Facebook. Charlotte served as VP of Programs for our volunteer board when we formalized in 2015, and was elected to continue that role in 2016. Charlotte has been sewing since she was a young girl and made all her own clothes. She made her first quilt when she moved to Florida in 1980 and needed something for her king-size waterbed. She's been hooked since! Charlotte loves fabric, thread, buttons, and beads! She can't pass up a challenge or call for entry. Charlotte has made many traditional and art quilts but now her eye is tracking the modern style. Find Charlotte on Pinterest, Instagram, and Facebook. Patti served as VP of Projects for our volunteer board when we formalized in 2015, and was elected to continue that role in 2016. Patti's first official quilting class was Eleanor Burns' very first "Quilt in a Day" workshop back in the 1970s! She has experimented with all kinds of sewing and crafts, done costume making for Mobile Ballet as well as taught children's craft classes over the years, but returned to quilting about five years ago when her goddaughter was having a baby. Since that time her quilting style has veered more into improvisational styles with bright colors. Like Allison, she's thrilled to have "found her people" in the SFMQ group. She also has developed a love for free motion quilting on domestic and mid-arm machines as well as creating donation quilts for Project Linus. She's thrilled to use her enthusiasm and teaching skills for The Quilt-A-Long project. Find Patti on Pinterest, Instagram and Facebook. Debby served as Co-VP of Programs for our volunteer board when we formalized in 2015, and was elected as Secretary in 2016. Debby has been sewing home decor for many years but has just found her style in modern quilts. Find Debby on Instagram and Facebook. Abbie served as Treasurer for our volunteer board when we formalized in 2015, and was elected to continue that role in 2016. I am Abbie Bill. I've been married for 33 years, have two daughters 23 and 29 and a grandson. My husband is a retired Broward County Sheriffs deputy. I started quilting about 30 years ago. My first quilt was a "quilt as you go" by Georgia Bonesteel. And I still have the blocks as I never finished it! I have quilted on and off since but have done mostly sewing for my own children. I got back into quilting about 5 years ago. I like all kinds of quilting, I'm not set in one style. What attracts me to modern quilting is the simplicity, randomness and everything doesn't need to match up! When not quilting or working full time, I like to do cross stitch, read and take care of my grandson. I look forward to learning more about modern quilting and venturing outside my comfort zone of traditional piecing! Nicole organized the first meetings of South Florida Modern Quilters from 2011 until 2015, when she handed over to a volunteer board. Nicole has been quilting since college and is mostly self-taught, thanks to the wealth of quilting sites on the Internet! She has embraced the modern quilting movement and its emphasis on improvizational quilting, bold colors, and wonky design. Nicole was one of the initial members of the NYC Metro Mod Quilters, and she started South Florida Modern Quilters when she relocated here in 2011. Although she is not a current Board member, she is enthusiastic about the growing Guild and is excited to see other local quilters get into the "modern" mind-set! Nicole's patterns have been featured in "Fabric by Fabric: One-Yard Wonders" and "Modern Blocks: 99 Quilt Blocks From Your Favorite Designers", and her hands grace the cover of "Quilting on the Go: English Paper Piecing Projects You Can Take Anywhere" (a nice surprise, although she wishes she had gotten a manicure beforehand)! Find Nicole on Instagram and Flickr. Ivy served as our first President after we formalized in 2015. Ivy was bitten by the quilting bug in 1998, and save for a mere seven-year break, she has been stitching by hand and machine ever since. Her favorite style hands-down is "wonky without intent," though she is finally getting into improv. She has a long-time love affair with English paper piecing and her heart belongs to crowded straight-line quilting. 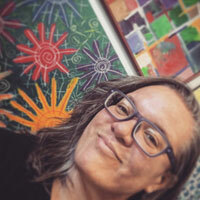 Ivy brings more than 20 years of detail-oriented work as a copy editor to her presidential position, as well as a passionate history of grass roots organizing within the crafting community. Quilting is where Ivy feels free and she is thrilled to help others discover the same joy. Find Ivy on Instagram, Flickr, Pinterest, and Facebook. Kate served as Secretary for our volunteer board when we formalized in 2015. 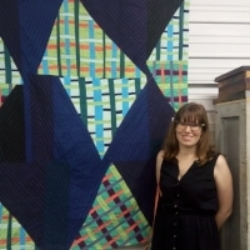 Kate is pretty new to the modern quilting world, and started quilting two years ago. She is inspired by the more traditional quilts made by her grandmother and aunt, and enjoys combining traditional with modern quilting. Her favorite style is “scrappy improv” piecing, and she loves big-stitch hand quilting. By day, Kate works as an account manager and trainer, and by night, she enjoys sitting down with her quilting hoop and hand stitching. She moved to South Florida just a couple of years ago, and is very happy to have found such a fun and inviting group of quilters at SFMQG.